Since I didn't see a thread on it here and with me doing a profile from it, I thought I would start off discussion about the awesome "new" mecha anime, Space Battleship Yamato 2199. 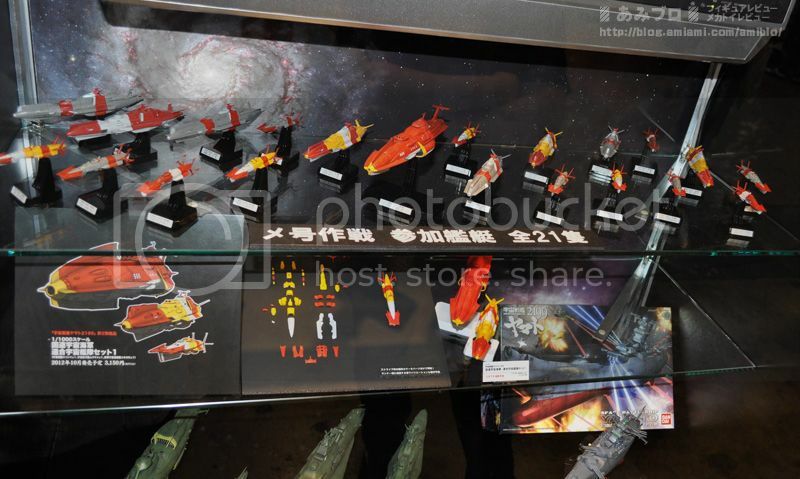 It is envisioned as a total remake of the original Space Battleship Yamato from 1974. They are putting it out in theaters, with a movie composed of the first two episodes out a few months ago and one with the next four out at the end of June. This will continue until they have all 26 episodes done with an eventual TV broadcast to follow. If you like classic anime, if you like mecha, if you like mechanical detailing, watch it. I can't emphasize it enough. They maintain the integrity of the original show while updating some aspects of characters, motivations, etc. They have added a bunch of new characters, mostly women, plus a smattering of men too. Probably the biggest there is changing one of the minor Black Tigers pilots, Yamamoto Akira, into a woman (with cryptic references to her brother being a pilot too). This is shown in the last one of the comparisons below. I've tried to match camera angles and shots as best I could, plus left the subtitles in to match the dialogue as well. There have been some changes, such as Sarsha remaining in her escape pod instead of being tossed out onto the Martian soil. I would go into more detail on the show now, but it's late. If there's any comparisons or screencaps people would like to see, I'm more then happy to take them. Almost forgot, I took several screencaps of the Cosmo Zero launching in episode 1 and managed to piece together an almost complete side view. Unfortunately the nose and the tail tips weren't visible during the scene. The next set of episodes are coming out. I watched episodes 3 and 4 and they were once again outstanding. Everything is incredibly detailed and this has been an excellent remake. I can do more comparison shots if anyone's interested and do those or just nab screen captures. Feel free to post requests for those and let's see some discussion! Here are a few shots from episodes 3 and 4 to wet your appetites. Only because it wasn't noticed. There is a lot of stuff going on in just the first 6 episodes. There is a trailer out for the Third Chapter which will cover episodes 7-10. This is the point were the new creators of this series will start to deviate more from the established series. While some of the plot episodes are familiar, some are not and it will continue like that until the end. Since they know the show will be 26 episodes long, they can plot it out better. They can remove the sillier elements and focus more on the serious or cooler elements. For example: In 1974, Yamato dealt with the Pluto Base's Reflex Gun by sending in a small commando team. Kodai, Sanada, Kato, and two combat team guys (red shirts), along with the ship's robot. It was Guns of Navarone style. (This style was used by Battlestar Galactica for the Gun of Ice Planet Zero story). The team wonders around trying to find the base, encounters a local lifeform. Gets in and runs into a set of trap rooms that seem out of place in a real base. They eventually get to the gun and set up some small thermonuclear chargers on timers that flow up the gun. The day is saved. In the Yamato 2199 version: Yamato sends out some fighter groups to search for the Gamilas Base out of a host of heat contacts all over Pluto (as the Gamilas are "Gamilforming" the planet until such time as they take Earth). Kodai leads one group in a Cosmo Zero with the female Yamamoto as his wingman in the other Cosmo Zero. Kato leads the other group in a Cosmo Falcon (what use to be the Black Tigers, but in the nearly 40 years, the name "Black Tiger" has become associated with a type of seafood product in Japan, and probably wouldn't be taken seriously if the fighter had that name now. Also the designers got clever and noted that in 1941, the Japanese Navy's main fighter was the Mitsubishi A6M Zero. The Japanese Army's main fighter was the Nakajima Ki-43 Hayabusa (Peregrine Falcon). So they used that). They scout out the planet while Yamato was going to draw the attention of the Gamilas Fleet they expected to come to greet them. Once this base is found and some of its defenses nuetralized by the fighters, and then Yamato is to take on the base with shells and missiles. They will not used the Wave Motion Gun because they fear its power might blow up the entire dwarf planet of Pluto. They do not consider it proper to destroy a planet to get just the enemy base at this time. Also who knows where all the pieces of Pluto might end up afterwards, or what the change in the gravity might do to the Solar System. This is a more logical approach that a base invasion with a six man team. Yes, you're right, and it was a pretty spectacular battle. Did you catch the Cosmo Falcon painted in black and yellow markings reminiscent of the Black Tigers, with a shark mouth like the old AVG in China during WWII? I think their operation was slightly different though. Kodai and Yamamoto were operating together as Alpha Squadron, trying to locate the main enemy base, while Kato and the others were separated by wing pairs and doing the same. Remember, Kato's wingman got hit early and he was alone until the other fighters regrouped to support him. I do need to get back to profiling Yamato stuff. I have the basic outline of the Yukikaze and the Hayabusa done already, as well as the 2199 Yamato (though I don't intend to profile that, it was just for a size comparison). Need to start detailing those, as well as finish the second ship patch (the hat insignia to be precise). That would be Shinohara's fighter. I imagine he is the second squadron commander. Kato being the first squadron and Wing Commander of Yamato's two fighter squadrons (assuming their squadron size is still 18 instead of 12). Two squadrons makes sense when you consider that there are two Cosmo Zeros that are supposedly good as squadron leader craft due to some yet unseen barrier system they carry. Kodai is the Combat Chief and has assigned Yamamoto to the second Cosmo Zero while taking the first himself. I imagine that one of those was suppose to be Kato's but judging by what they were doing in episode 4 to take out the tanks, both Kato and Shinohara went right to the main hanger with the Cosmo Falcons, and not to the Cosmo Zeros. Kato mentioned "borrowing them". Since Yamamoto was not an official pilot yet, I can't guess who the second Cosmo Zero would be for normally. We only saw 12 fighters head toward one of Pluto's moons. Two Cosmo Zeros and ten Cosmo Falcons. This is ten out of 36 Cosmo Falcons. So either they didn't use all their fighters for the operation. They launched them in waves we didn't see. Or they have more planes than pilots onboard. So far we have three paint jobs for the Cosmo Zeros though "00" and "01" are nearly identical. Cosmo Zero "02" is quite different though. We also have four paint jobs for the Cosmo Falcons. The UN Far East area's local Defense Fighters we see Kato using against the Gamilas carrier's fighers in epiosde two, and the three we see in episode 5 and 6. The standard blue, grey and yellow fighters, the blue, black, grey, and yellow one with the shark teeth that Shinohara flies (number 107), and the grey one with red trim that Kato flies (number 100). It is possible that the two Cosmo Falcon squadrons have different paint jobs, but at this point we can't be sure of that. All we know for sure is that Kato and Shinohara's fighters are different from the others. 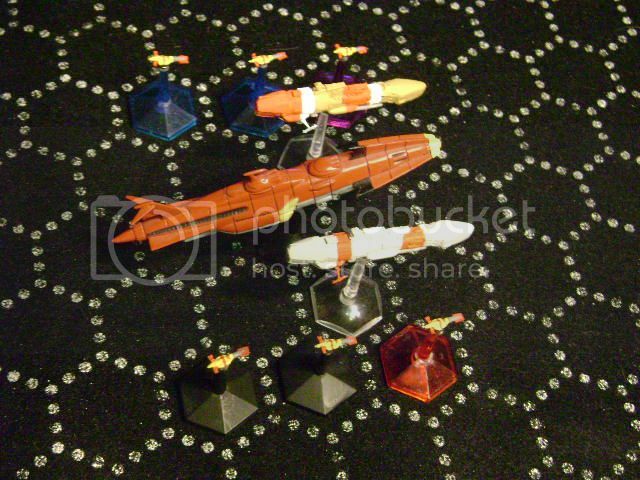 These are reportedly the colors and ships used at the Battle at Pluto in the remake. It could be used for modeling purposes since I am not entirely sure how Bandai is selling these model kits (1:1000 scale). I know they are selling the three set on the shelf below. One Battleship, One Cruiser, and One Destroyer. 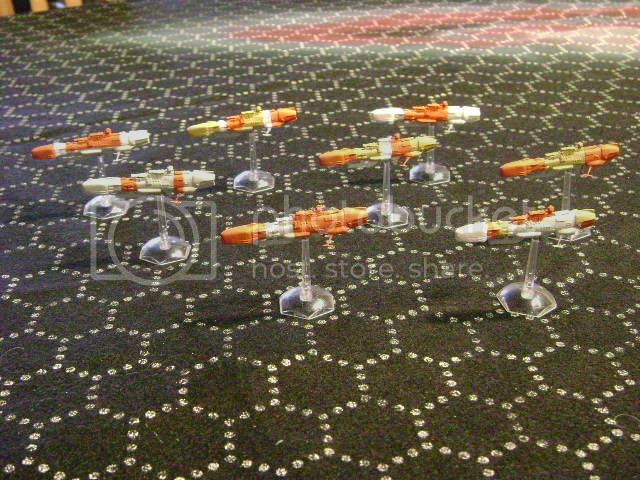 At an earlier convention they showed the destroyer in three paint designs and here they have the whole fleet painted up. But no word yet on individually sold models or if they came in the other colors or not. My imagination says that each color was an specific earth fleet or division earlier in the war. Now at the end, this is all that is left. The flagship, Kirishima, was either part of a fourth division (the only survivor) or part of the group with yellow, red, and white markings. The ships on the left look bigger than those on the right. You can barely see part of the Gamilas 1:1000 scale ships on the bottom shelf. My thinking is that the Kirishima is part of the red and white squadron. Despite the little yellow markings on it, the line between the white belly and red dorsal is just about the same. When I finish my Yukikaze line art, I already plan to do at least one ship in each of those schemes, plus one in the slightly different original series colors, and finally at least a couple dazzle camos. I've identified a couple grey/red options, but I haven't been able to pinpoint a hull number on any of the red/white Isokazes. I'm looking forward to when those models come out. I think it's October for the Kirishima/cruiser/destroyer set. They are all Radetsky-class battleships painted up like older Earth cruisers. They were paint before the image farther above came out. They fit in nicely between a old Bandai model of the Flagship and the Musashi Enterprises' Lightning-class torpedo destroyers. Last edited by Anonymous on Thu Sep 06, 2012 9:29 pm, edited 1 time in total. They look good. Great work on them. The episode 7-10 preview shows Yamato getting into a fight with a Gamilon fleet, so that might showcase some more of the new technology changes this remake has verses the original. I've still not be able to pin down how the shields work. I know they have a time limit and they seem to deflect energy back into space up to a certain amount before being penetrated. But I don't know if the power needed to keep the shields up interferes with things like: firing the wave motion gun, or warping. As I play the table top Star Blazers game, and have been tinkering with 2199 modifications, such information is kind of critical to how the shields get added to the game system. Presently, at least for the Gamilon ships, I have them as a fixed number of points (six) that deflect that small amount of damage away from the hull before being breeched. Once breeched the ship requires to generate special power to recharge the shields (this is the power normally used for warping or special weapons in the game system). They only need six points of power to get the shields back up, but they don't generate power all that fast if they are moving (1D4 of power per turn moving, 1D6 while stationary). Presently I have it so they don't generate power at all while the shields are on (the power is being channeled to the shields instead). I presently don't have a recharging system in the rules, though one of the players simply rolled for power and put that back into the damaged shields to rebuild them. Gamilon shields can be penetrated by physical weapons (missiles and shells) as well as more advanced weaponry (shock cannons and wave motion guns). Earth and Gamilon shields seem to be able to deflect older Earth energy weapons and Gamilon energy weapons. The older Earth cruisers and battleship were equipped at some point during (or just before) the war with a bow mounted shock cannon that became the protoype for the turreted main guns of Yamato and future Earth warships. These weapons are said to have been what turned back the Gamilon advance at Mars at somepoint during the war (and made Okita a hero). As we see in later episodes, Yamato's shock cannons blow right through the Gamilon shields and armor (and make a very satifying gong when they are hit). One imagines this is what the bow cannons on the other ships could do as the crew didn't seem all that surprised by the results of the shock cannon fire. Only the Wave Motion Gun got a rise out of their gunnery officer. And while the Yukikaze is said to have advanced torpedoes that allow them to damage Gamilon ships, in game terms I couldn't find an equivalent since the Type One torpedoes are the weakest missile weapon in the game short of anti-fighter missiles and fighter carried torpedoes. So, in game, I modified the Yukikaze to match part of the description in that the weapon would be used on Yamato. I replaced her torpedes with guilded Fusion Shells (the shells used in the shock cannons to take out the Gamilon carrier in episode two, a Gamilon destroyer in episode three, and to shell the Pluto base and fleet in episode six.) In game, I used the Wave Motion Cartridges to assign range and damage, fitting them like a heavy shock cannon. They do less damage than the normal torpedoes would (if they all hit), but have the advantage of not being able to be shot down. Also I took the wave motion cartridge extra critical damage idea and toned it down for what should be its predicessor. Instead of an extra internal critical hit her shell penetration, I have it as one for every three shells that penetrate. However, on the chart, every Gamilon warship short of their battleships will be automatically penetrated, and their battleships have a 90% chance of being penetrated. Since Yamato uses triple barrelled turrets...every turret fired will cause an extra crticial hit even against everything the Gamilons have short of their flagships, and those have a very high chance of being penetrated as well. Mounting a three salvo (nine shells) limited version of this into Yukikaze give the Earth fleet a long range hitter that will potentally cause heavy damage to Gamilon ships. However I usually have this weapon only on Yukikaze while the other Earth destroyers have the standard torpedoes. The last time we played out the Battle of Pluto, all the Earth missiles and torpedoes were intercepted by Gamilon anti-missile batteries and dual purpose weapons. The only physical weapons to hit were from Yikukaze (finished off a heavy cruiser). Most of the other damage was done by concetrated fire from the battleship and cruisers. Enough to overwhelm the Gamilon shields and cripple or destroy Gamilon cruisers for the most part. Sometimes they managed to take out a destoyer or two with piecemeal fire, but most of the damage was the focused fire on the cruisers. They managed to destroy seven Gamilon warships out of 33 and damage in some way another seven warships (three of them critically, including the one battleship). The Earth fleet was lost in total (all 21 ships). Definitely enjoyed the trailer for the third movie. Too bad it was delayed back to October. I guess the February 2013 date for the final movie is blown out of the water now. If they get back to 2 months between each movie after 3, they will only be at movie 5 then. Rewatching episode 5 earlier today, I noticed that Yamato the equivalent of the fantail name modern ships have, compete with the name in hiragana like JMSDF ships. I also wonder if the Umezu and Seagulls come from the door the forward of the sideways-facing doors the Cosmo Zeros come out of the hangar from. Or, failing that, what comes out of there. I imagine the smaller one a deck up is crew access. It's a pity the rest of the destroyers didn't have the torpedoes Yukikaze had. They'd be much more effective in the traditional destroyer tactic of massed torpedo attacks. Run-and-gun instead of fighting in battle lines. Animesuki seems to be the place (aside from Starblazers.com) that gets the most conversations going on. It is too bad that hardly any of the blogger are reviewing or even seemly paying attention to this show. I've encounters a few places that I've not joined that have talked about it a little, sometimes with massive misunderstandings about how the show works, or what changes have been made verse the original show. But mostly things are silent. Fortunately there are us fans here you can talk about it with. I didn't grow up watching Starblazers, and I'm not a fan of bowdlerized anime series, but I'm a big, newer fan of the Japanese side of it.